On the last Sunday of every month at approximately 6pm, one can find St. Louis’s artists and creative minds sitting shoulder-to-shoulder, congenially slurping soup and poring over artistic proposals. If you haven’t yet attended Sloup, let me bring you up to date. Started by Maggie Ginestra and Amelia Colette Jones in February 2010, Sloup is a monthly soup dinner that has awarded over $4,700 to creative projects in St. Louis in just one year alone. Its formula is simple: make a big pot of soup (vegan-friendly preferred); invite friends, friends-of-friends, etc. 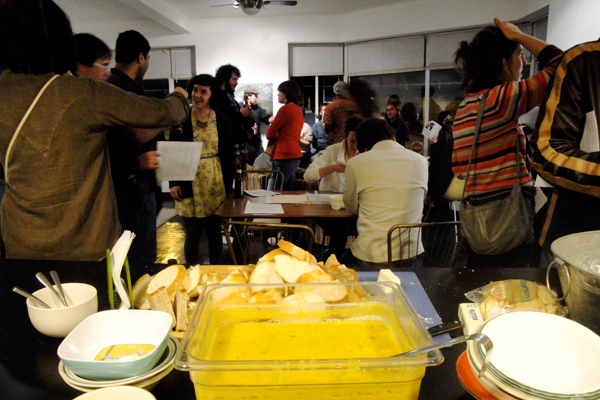 ; charge a small fee; provide guests with both a bowl of soup and a ballot to vote for a creative project. At the end of the evening, the money raised from the soup dinner goes to the winning proposal. Though Sloup is quickly becoming a St. Louis fixture, joining the ranks of toasted ravioli and frozen custard, the model is also part of a rapidly growing international soup network. Commonly known as “Sunday Soup,” similar programs have popped up throughout the world, with locations in Chicago, Grand Rapids, Mexico City, Newcastle, Kiev, and Milan, to name a few. Sunday Soup’s simple formula is what makes it so adaptable. Yet, despite its simplicity, it responds to a much more complex dilemma facing art funding today. In response to limited funding for the arts, many organizations shape their proposals to fit criteria established by funders. This approach limits not only expressive content, but also restricts funding for individuals and organizations that do not neatly fit into the non-profit / for-profit dichotomy that defines much of the art world.1 In contrast, Sunday Soup presents a transparent process that directly asks individuals to determine their own funding criteria. While the true origin of Sunday Soup is debatable, many credit InCUBATE (The Institute for Community Understanding Between Art and the Everyday) in Chicago as an inspiration. InCUBATE defines itself as “a research group dedicated to exploring new approaches to arts administration and arts funding.”2 InCUBATE’s commitment to developing new funding infrastructures has helped legitimize Sunday Soup, separating it from recently popularized supper clubs that lack such a focused social agenda. In addition to Sloup in St. Louis, two Sunday Soups in particular trace their roots to InCUBATE: Saturday Soup in Newcastle, England and Granaio in Milan, Italy. InCUBATE, however, does not claim ownership over Sunday Soup. As co-founder Abby Satinsky explains, “I am less interested in a franchising model and more into letting the seed grow where it may.”3 Thus, any offspring of InCUBATE’s model is unique. Sloup (St. Louis), Saturday Soup (Newcastle), and Granaio (Milan) are apt examples for how different organizations tailor Sunday Soup to fit their distinct communities and cultural practices. Amelia Colette Jones, co-founder of Sloup, was first exposed to Sunday Soup at InCUBATE while living in Chicago. Having earned an MFA from Washington University, Jones felt that the model could work well in St. Louis’s cultural landscape, which was witnessing a proliferation of artist-run spaces. When she moved back to St. Louis she teamed up with Maggie Ginestra, founder of Stirrup Pants Chapbook, to formulate a variation on Sunday Soup that could help unite St. Louis’s various artistic communities and generate additional funding for the arts. 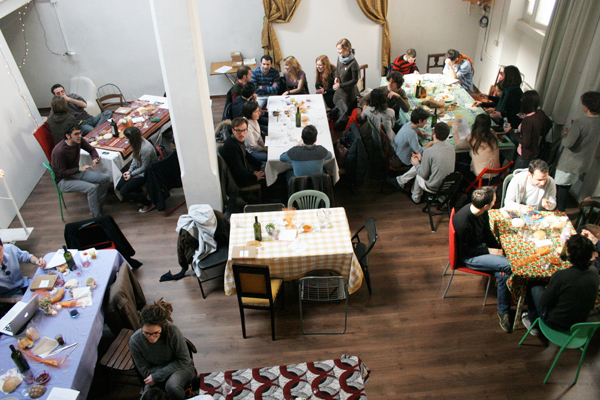 There are a number of key differences between InCUBATE’s Sunday Soup and Sloup. Rather than single-handedly provide the venue and soup, Amelia and Maggie collaborate with local organizations—including the Urban Studio Café, the Contemporary Art Museum, and Pig Slop Studios—as well as area chefs who make in-kind gifts to Sloup each month. This strategy spotlights local talent, reduces costs, and every month, as Ginestra explains, creates a “combination of elements that will never exist again.”4 Those unfamiliar with St. Louis could easily overlook another quality of Sloup that is unique to our city: it plays upon the competitive spirit already existent among local art organizations. Sloup brings such rivalry to the surface, transforming it into a positive force by encouraging artists and organizations to submit proposals that continually raise the bar for the arts in St. Louis. Newcastle-Gateshead resident Michael Mulvihill started Saturday Soup in November 2008 after attending a residency at InCUBATE in Chicago. As arts funding in the United Kingdom primarily comes from the Arts Council, which has strict criteria for awarding grants, Mulvihill felt the need to introduce a new funding scheme to his community at Waygood Gallery and Studios. 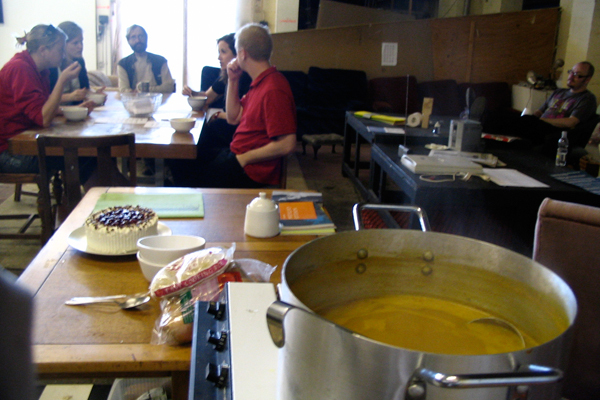 Like InCUBATE, Saturday Soup is held at the same venue each month and guest artists and curators are invited to cook and lead a discussion (I cooked for the Waygood group in the summer of 2009). Newcastle’s Saturday Soup has faced unique obstacles because, as Mulvihill notes, the reserved nature of the English often results in fewer proposals. He explains, “I think for many people it was sharing a meal that was important, and the micro-grant was a bonus.”5 As a result of the smaller selection pool, Saturday Soup awards larger grants every three months, rather than on a monthly basis. Mulvihill has now passed Saturday Soup on to the High Bridge Artist Association, however, the model has proven its viability in Newcastle and can easily be modified for the new community that it will come to serve. The Italian word “granaio” functions as a pun. It literally translates to “a granary or barn,” thereby conjuring associations with large quantities of food. However, “grana” is also a vulgar way of saying “money,” which, after all, is the underlying motive for the gathering. In 2008, during her time as an intern at the Art Institute of Chicago, Milan resident Camilla Pietrabissa regularly attended Sunday Soup. After returning to Milan, she started Granaio in January 2010 and has now hosted five soups, including a recent one that was part of a Venice exhibition on Italian social practices. Unlike Sloup and Saturday soup, Granaio doesn’t center around soup at all. In true Italian custom, the main course is filled with carbohydrates and the dinner is structured like a celebratory event where guests are formally seated. Each dinner takes place at a different venue with a guest chef and culminates in a formal presentation or performance. Pietrabissa explains that “besides from pure political activism,” there is “the feeling that in Italy there’s a lack of activism during university years.”6 Granaio shows participants the power of collectivity and the value of a transparent granting process. As a mark of its success, Granaio has prompted the opening of Sunday Soup in Bologna, illustrating that even in cities located just two hours apart, Sunday Soup may be modified to the cultural conditions that define the ways in which artistic communities live, work, and grow. As artists and scholars from St. Louis, Newcastle, and Milan customize Sunday Soup to fit their unique communities, they directly test its versatility of on an international scale. Michael Mulvihill captures the essence of what makes Sunday Soup so adaptable, saying, “the idea is so simple and beautiful that it’s kind of self-sustaining.”7 It would be an arduous, and admittedly, futile task to trace each network that has led to the global emergence of Sunday Soup. However, these few examples illustrate that international networks often develop through direct personal exchange, a quality at the heart of the soup dinners themselves. 1. Abigail Satinsky, “Making-do: a pragmatist approach,” Artist-run Chicago Digest (Chicago: threewalls/Green Lantern press, October 2009). 2. InCUBATE. “About.” Accessed March 30, 2011. http://incubate-chicago.org/about/. 3. Abigail Satinsky, “How to Grow,” Proximity Magazine #7 (Spring/Summer 2010). 4. Maggie Ginestra, unpublished statement from an interview with the author, March 25, 2011. 5. Michael Mulvihill, unpublished statement in email to the author, April 7, 2011. 6. Camilla Pietrabissa, unpublished statement in email to the author, April 8, 2011. 7. Michael Mulvihill, unpublished statement in email to the author, April 7, 2011. Sloup and Sunday Soup images by Francesca Wilmott. Granaio image courtesy of its organizers. Stock has become a great part of the Portland arts community, http://portlandstock.blogspot.com/. Thanks for spreading the word about all these great efforts to keep projects funded!